I wish to snooze undisturbed today. I am keeping the bed warm for when Äiti comes back with her cup of tea. Afterall, I am exhausted. I have just become a published author and this is a very exciting and tiring process. It took me ages to supervise the correct positioning of every post and photo from the early days of my blog. And then, a few days ago a very exciting package arrived - Volume I of my postings! It is very good quality - which of course does not come cheap! We used blurb, and would recommend them to anyone wishing to put their ponderings down into the old fashioned format on paper. Äiti likes books. She has hundreds of them and they take up far too much of her time as far as I am concerned. However this is one book I do not mind her having. And she better get on with volume II soon! You look very comfy, Punapippuri! Mebbe Aiti will read volume 1 to you while in bed! Purrs. That's the greatest book every mommies should have ! What? A book? IRL?! Are there many of them, can this item be seen somewhere? Or is it only one copy? Those blog books look cool! I have almost 1,000 posts - it would probably be a fortune to put one together for mine! Sorry to hear that you have flu in the family. 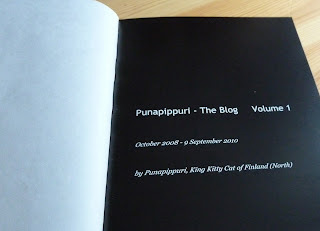 But Big Congratulations for the book, Puna! You must immediately send in your application for the membership in The Writers' Club! Great!! Wish your Äiti gets well soon! We are so honored to know you, Puna--a King and now an author! No wonder you need an extendo nap. Mommy is going to check out blurb. Congratulations on your book! We love the cover photos. Of course, every time mum sees a Puna baby photo she starts that squeeing business and acts all crazy. We hope your Aiti is feeling better. The flu can make you feel worse than almost anything. We know you will take great care of Aiti, but are you eating and taking care of yourself? Love to all. Sweet kisses for you. 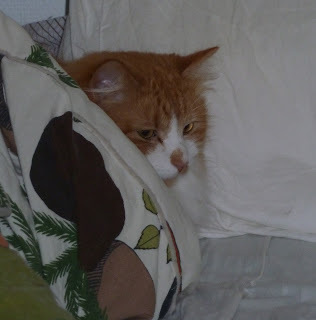 That looks like a good idea to wate for Aiti to come back to bed. 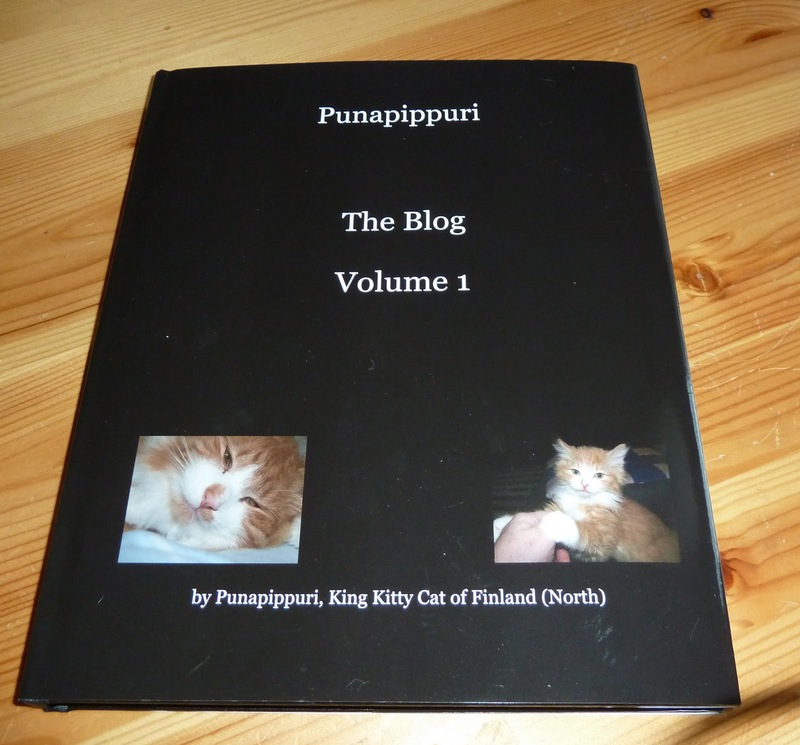 Your blog as a book is a very good idea.